Visiting a park on thanksgiving was always going to be a serious gamble, with no way of judging the likely size of crowds. With that in mind, it seemed best to schedule the pair of parks with no must do attractions, allowing me the flexibility to skip anything at all if the queues were unreasonable. 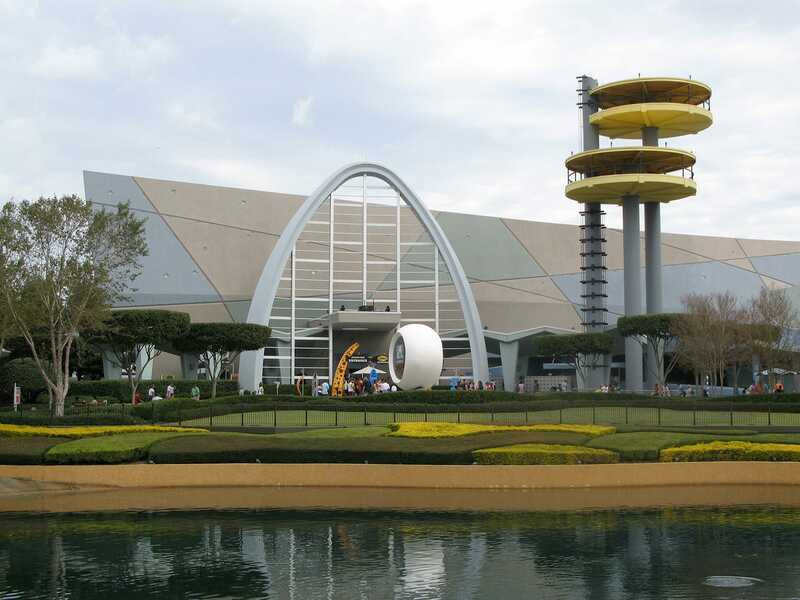 As it was, Surprisingly enough however Universal Studios Florida was not busy, with waits topping out at fifteen minutes on the major attractions. Furthermore, a number of these had single rider queues which reduced the wait time right down to nil. My previous trip report tells the complete story of Revenge of the Mummy, and my comments from then hold. The ride remains a great example of what can be done with a middle of the road coaster when a little imagination is added into the budget. I was also able to walk straight on to Men in Black, into a seat with a completely defective gun. Target shooters may not be my particular strong point, but even I can achieve a score better than zero. The queue for ET Adventure seemed to be moving pretty slowly, but eventually I made it to the front, thrilled to see that it appeared to be the same as the version I'd enjoyed so much in Japan. Unfortunately, just as our bicycles pulled out of the station the magnificent John Williams soundtrack ceased abruptly, to be replaced by a rather drab American voice advising us that our journey would be continuing momentarily. As it was, our journey did continue for a while, albeit with only the whirring of the electric motor on the ride to keep us company. The various animatronics below clicked on and off, with mechanical clunks that one should not and normally cannot hear. Eventually we stopped dead half way up an incline, with the car in front in sight. Ten minutes later the music started again and we began to move in short bursts, stopping every hundred feet or so presumably in the next block section. This neatly spoiled the ride. It would have been nice to try it again without the interruptions, but maintenance had closed off the ride queue, presumably to fix whatever problem tripped the system in the first place. Making a mental note to come back later if time allowed, I walked across the boardwalk to the other park. As a previous visitor to Universal Studios Islands of Adventure there was no particular rush for me today. 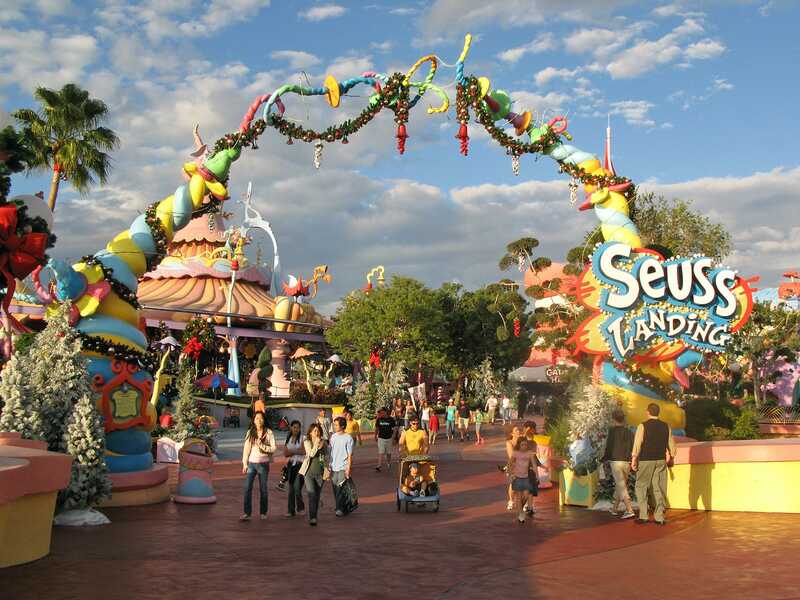 The only new-to-me attraction I tried was the Cat in the Hat dark ride, a whimsical journey through the world of Dr Seuss. Memories of more than twenty years ago which I'd managed to suppress all came flooding back at once, much to my chagrin. To be fair, it was a quality dark ride and certainly enjoyable from the visual aspect, but the audio? I do not like it, Sam I Am! An honourable mention needs to go to the tour guide on the Poseidon's Fury walkthrough. Taylor did an altogether brilliant impression of being terrified, slightly overdone so the adults could tell it was an act, while realistic enough to make the kids in the audience shiver with excitement. His commentary was also interspersed with enough humour to keep things interesting. An ancient message has appeared on the wall. Oh look, it's in English, how convenient! Later, when invited to make a wish, his answer was spontaneous; I want to learn how to talk to girls and how to get out of here! Beyond that, Amazing Adventures of Spider-Man is still one of the best dark rides in the known universe, Incredible Hulk is still pretty bumpy, and the Duelling Dragons are still fantastic rides. Both tracks are gloriously intense, and a demonstration of what B&M can do if they want to (or perhaps what they used to be able to do). With plenty of spare time to kill I took the opportunity to wait for both front and back seat rides on each track. For me the Fire track has a definite edge, especially in front, but they're both still top ten coasters. It'd be nice if it was easier to see the rides without being a passenger, as they're pretty challenging to photograph, but that's really a nitpick. At the end of the day, I met up with George, Darren, and Andy for a meal and a show. The Blue Man Group shows have become very popular of late, and we decided to attend the one at Universal to see what all the fuss was about. Rather than describe the detail of the show here I'm going to be lazy and link to the full description on Wikipedia. Suffice it to say that I've not laughed so hard in years; one cannot recommend the show highly enough. Just a word of caution for those sitting in the front few rows; you are provided with ponchos, which you would be foolish not to wear.